la porte rouge: summer so far....great. so i add between rows almost everyday. we have done some good stuff, like berry picking, walks, joke telling. 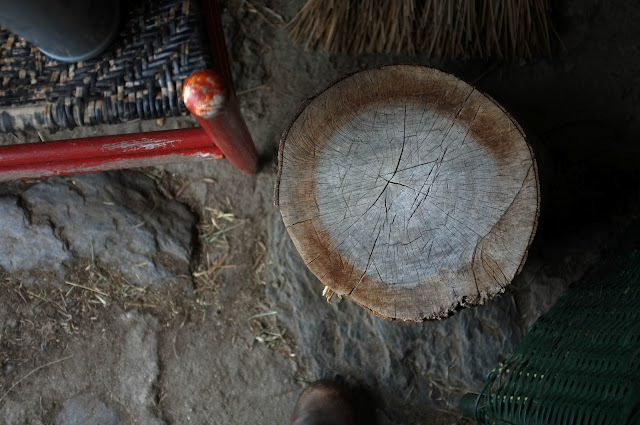 we have shared some good meals, eaten our weight in fruit. we have given our big dogs baths, there has been show marathons, not really my thing but the kids keep reminding me it's summer, more play and relaxation that chores and work aunty. actually today i have spent it mostly in the garden and them indoors, it is hard to realize what is fun for me is not exactly fun for them. i think i romanticize gardening and long walks that i can't imagine them not liking it so. we did put up a tent, getting ready for a weekend by the lake in the mountains i can not wait and that is something everyone is excited about, i have been tempted to sneak in it right now with a good book. did i tell you mondays are the hardest to share, they have become my favorite days of all days, perhaps one day i will put into words. we are waiting for noisette our duck to hatch ducklings, it was not our plan but she hid them pretty good and she has been so dedicated, do you know they hardly eat and drink so that they can keep their eggs warm, incredible mothers. please forgive me it seems like i can't do summer well and keep focus too, but i love it here my little place for story telling. i have also started to use instagram, i am very nervous telling you since i love how i am able to share vignettes here on la porte rouge it quiet and intimate, but if you would like to see daily tidbits from the hill then you can find me on instagram under laporterouge ( wow i am actually shaking). dear friends, thank you for being here, honestly you guys are incredible wise and kind. These beautiful pictures speak sweetly of your dreamy summertime. Excited for you to get away for some tent time along the lake and excited for dear Noisette too. Such wonderful news! This weekend we took a motorbike ride through the redwoods and to the coast for lunch. I thought of you. Happy summer, dear Nadia, thank you for sharing your happiness. The cat and the chicken pic….that is priceless Nadia:) Looks like summer is off to a winning start! Say hi to the kids for me! Stunning pictures--all the beautiful reds. BEautiful photos, as always. I hope that you enjoy your summer holiday with your neice and nephew! I have been a reader for a very long time, and I LOVe your blog. I hope you do not mind, but I wanted to share your blog with my readers, so today I wrote a post about your incredibly special blog and your magical images. I have several links back to your blog and have noted that all of the images are from your blog. I am sorry I did not ask ahead of time. Please accept my apology. If you would like me to remove the images I will, but I did not think you would mind as you have given permission to Pin them. Thank you for sharing your wonderful Vermont, and your home and life. I feel like a treasured friend each time I visit. You have a beautiful blog. I read about you at Pine Cones and Acorns. I love all I see. you sound to be bursting with joy today. it is so lovely to read. Looks sooo good and sounds good too! :)Like a good dream. In love with the cat and the chicken. They're adorable. 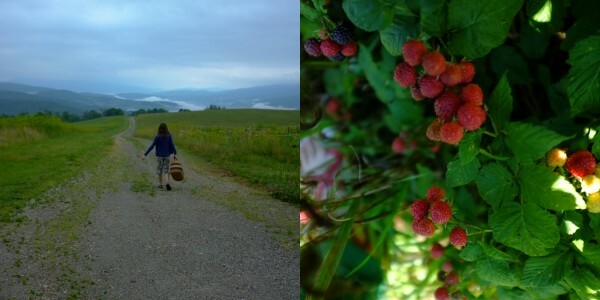 You pictures are pure summer- those berries! The last picture of the cat and the chicken not only made me smile but also chuckled as I glanced at my 2 cats currently laying like sausages in the hot sun and started to wonder how they would react in this situation. Your blog was recommended by Elizabeth at Pinecones and Acorns. 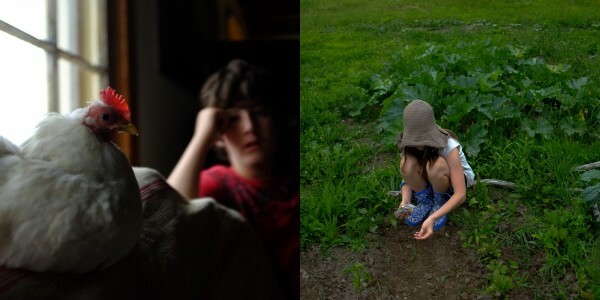 I see why: beautiful photos....very moody and full of drama. And, lovely words. Delighted to enter la porte rouge. I agree with the young'ins, more play. My mum use to make up games to get me in the garden. Of course I am the thick variety, and pretty much fall for anything. Now she appeals to my wallet. So excited you are also on Instagram, more beautiful photos to see!!!! I just wanted to let you know how enchanted I have become from seeing your photos and reading your beautifully written posts. 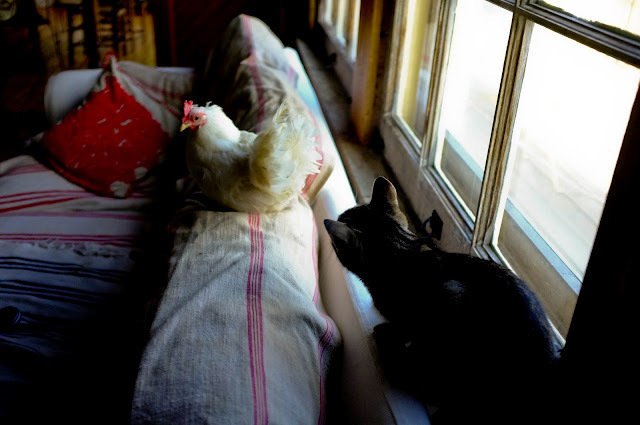 Lovely the little cat & the chicken! :) F.
I am looking forward to looking at your instagrams! I'm a city girl, through and through, but all your dreamy pictures of life on the hill always have me daydreaming about running away and finding a little farm of my own. I wish you peace and relaxation this summer! love the colours and tone. And happy summer has been kind so far. love stopping in here. these speak of nothing but summer. I have always been taken by the touches of red in your photos. They add life in so many ways. Blessings for a summer of peace.